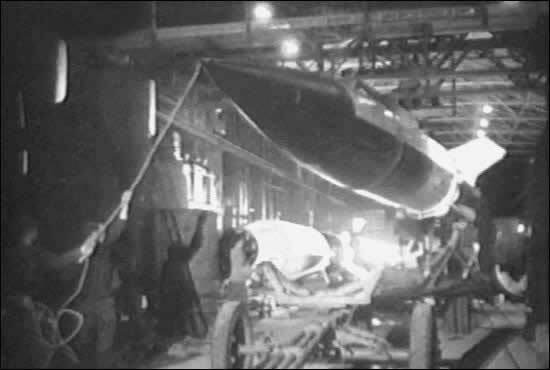 Loading the V2 Rocket on to trailer. V2 Rocket launch blast off. V2 Rocket heading towards Britain. 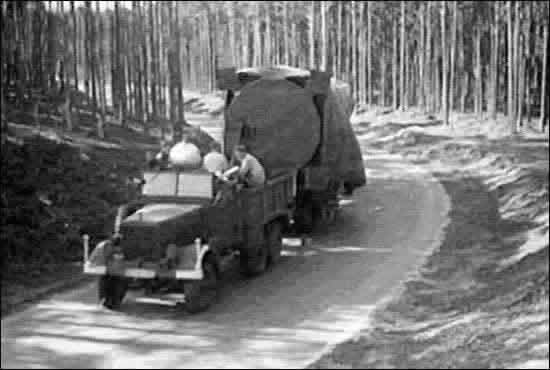 Transportation of the V2 Rocket. The Rocket Command Control Post. 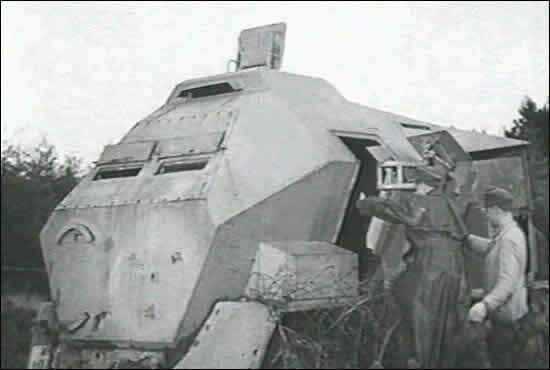 V2 Rocket painted in camouflage, launched from a permanent site. 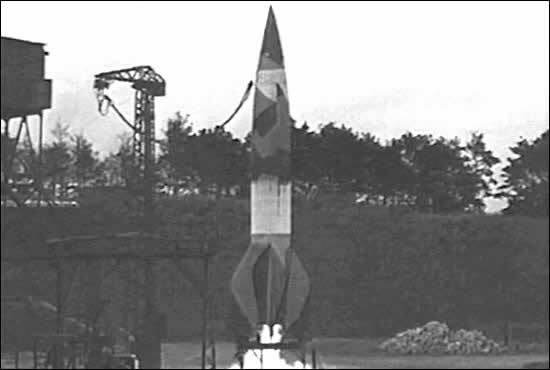 The V-2 Rocket (also called the A-4 or Aggregat 4) was developed by Wernher von Braun, Walter Dornberger and Hermann Oberth at the rocket research station at Peenemunde, and was first used in September 1944. 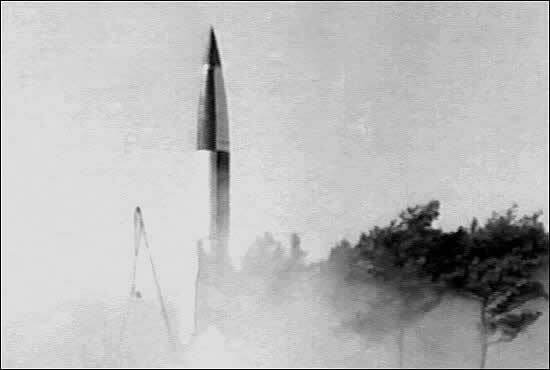 Like the V-1 Flying Bomb, it carried a one ton warhead. The liquid-fuelled rocket was 14 metres (47 feet) long, capable of supersonic speed and could fly at an altitude of over 50 miles. As a result, it could not be effectively stopped once it had been launched. 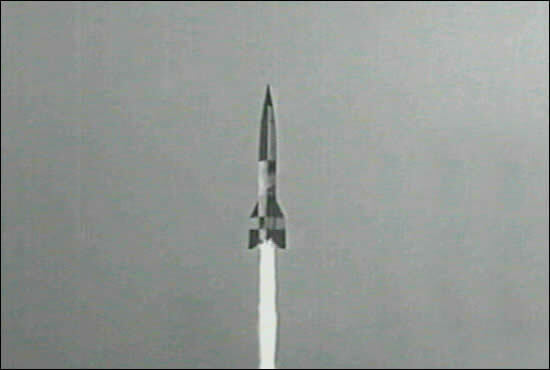 Of the 5,000 V-2s launched, only 1,100 successfully managed to reached Britain. These rockets killed 2,724 people and badly injured 6,000. After the D-Day landings, Allied troops were able to capture the launch sites and by March 1945, the attacks came to an end.